SpaceX Dragon: Capsule successfully berthed to space station. 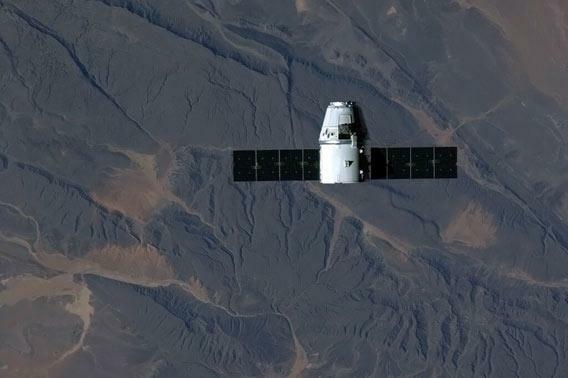 The Dragon capsule over Africa, as it was on approach to the International Space Station on Mar. 3, 2013. Click to ensmaugenate. Well, that was fast! This morning, the SpaceX Dragon capsule was successfully berthed to the International Space Station. After all the drama that started this mission, the successful orbital mating brought cheers—and a sigh of relief—across NASA. 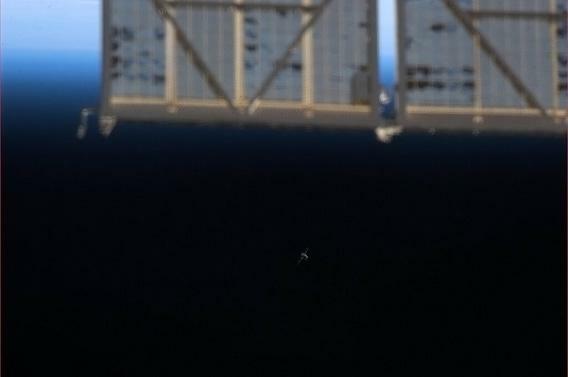 The capsule began maneuvering toward the ISS last night, and took several hours to approach. At 10:31 UTC (05:31 Eastern US time), when it was a few meters away, the astronauts used the Canadarm2—the station’s large, articulated robot arm—to grapple the capsule. After a few hours of checkouts, the arm brought Dragon in, and the capsule was berthed at 13:56 UTC (08:56 Eastern). 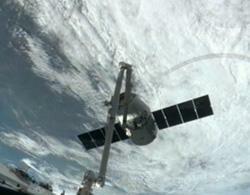 The Dragon on apporah to ISS. It’s the small dot in the black of space below the solar panel. You really have to see the higher-res version to appreciate how beautiful this picture is. Geeky note: NASA uses the term “berth” because the space station doesn’t move under its own propulsion during the rendezvous. “Docking” is used when both spacecraft are capable of maneuvering under their own power. The space station does have thrusters to boost its orbit or make orbital changes in case some bit of space debris is detected that might get too close, but those are gross maneuvers, not the fine ones you need for mating. At 10:31 UTC the Dragon capsule was successfully grappled. Click to enscyllanate. The Dragon capsule is carrying over a half-ton of supplies and equipment for the astronauts on ISS, most of it being scientific hardware. The next flight to ISS, scheduled for Mar. 28, is a Russian Soyuz TMA-08M that will carry three more astronauts. On Apr. 18, a European Space Agency Automated Transfer Vehicle (named Albert Einstein) will bring several tons of supplies up, including food. A week later, on Apr. 24, a Russian Progress capsule will bring more supplies as well. Dragon will stay with the station for about three weeks. During that time, astronauts will load it with over a ton and a half of equipment, supplies, and trash to bring back to Earth. The mission is scheduled to end on Mar. 25, when the capsule will de-orbit and come back to Earth in the Pacific a few hundred kilometers off the coast of Los Angeles. Again, congratulations to NASA and SpaceX for pulling this one out. Well done!